The Samsung Galaxy Note from AT&T is now available in stores and online. The Galaxy Note has been called a lot of things. A big smartphone, a small tablet… some have dubbed it a ‘phablet.’ Whatever you want to call it, the Galaxy Note takes up a lot of room in a pocket. It has a 5.3 inch screen, with a resolution of 1280×1024. One of its most unique features is the S pen. A stylus which can be used for making sketches and taking handwritten notes on its touchscreen. According to Samsung, the galaxy note will be able to decipher handwritten notes and change the letters into standard text. 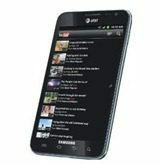 The phone comes loaded with Android 2.3 (Gingerbread), but Samsung says an update to Android 4 (Ice Cream Sandwich) will be available later on this year. Power wise, the Samsung Galaxy Note has a 1.5 GHz dual core processor and 1 GB of RAM. The phone also features an 8 megapixel front facing camera, and a 2 megapixel camera facing the rear. The phone is priced at $299 (with a two-year contract), at AT&T stores and through AT&T online. It’s listed for $50 less at Amazon Wireless.